In this lesson we take a look at SFS, an amazing system for mastering all fingerings, all positions in all keys for any type of scale, WITHOUT BOX SHAPE MEMORIZATION. 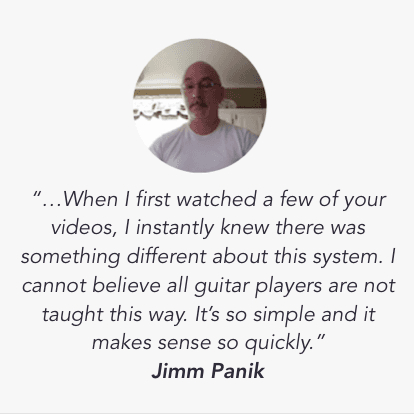 Learn how to freely navigate the fretboard in record time. 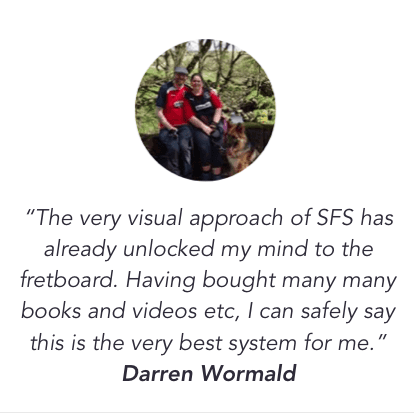 SFS (or the String Fragment System) is a fretboard mapping system that helps you play in all positions and all keys, moving freely all over the fretboard, without ever memorizing scale shapes. It’s a great alternative to boring shape memorization and it works extremely effectively. You learn in minutes what can sometimes take months using the old fashion way. But let's get right into this and I will let you figure out the extreme value of this approach on your own. Even if you never learned these scales before, in a few minutes you will know how to play all fingerings of the pentatonic scale everywhere on the fretboard, without memorizing a single shape. 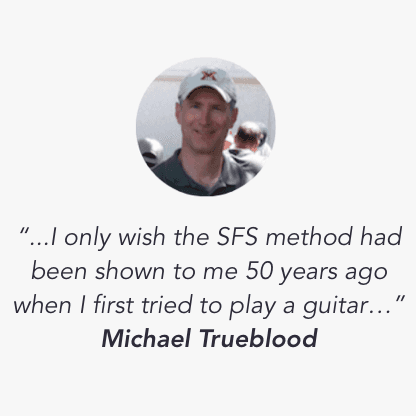 There is a gradual methodology behind SFS that allows you not only to become an expert on fingerings in record time, but also become proficient in controlling the sound and being truly creative, and jumping all over the fretboard effortlessly. 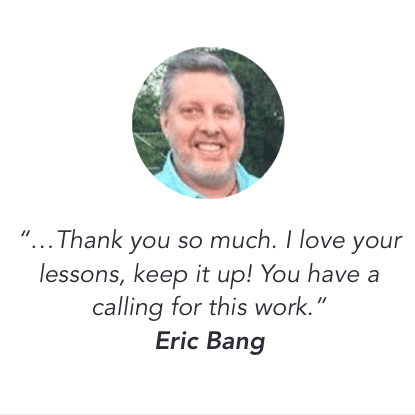 Of course there’s no way I can share all that in a single lesson, but still, you will be able to play all fingerings, right now, using this amazingly effective concept. So we have SF1 (String Fragment 1) which has 2 notes 3 frets apart, and then SF2, 3, 4, which have 2 notes 2 frets apart, and then SF5 which looks like SF1 but is located one fret lower. 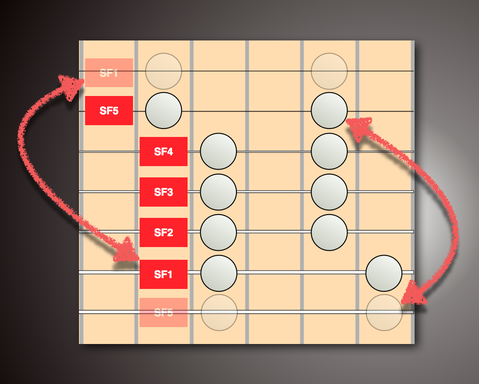 Make a mental note of that: SF5 is located 1 fret lower than SF4. 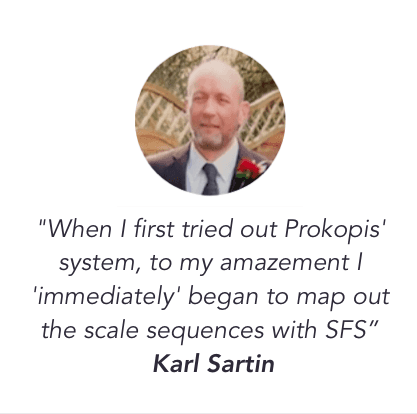 Then the system starts again with SF1 because this system is a cycle, you can just repeat it on any number of strings. So let’s apply this on the standard 6 string guitar fretboard, but before we do, you need to keep one thing in mind: Because of the way a guitar is tuned, when crossing from string 3 to string 2, you need to shift one fret up. I’ll say it again so you don’t forget this. This is hugely important: When crossing from string 3 to string 2 of the guitar you need to shift one fret up. You’ll understand this better when you see it in action in a few seconds. So there it is. It takes just a few minutes to map any scale everywhere on the fretboard. Now granted, it will take some work to get used to building the system on the fly and doing the shifts automatically, but you can really learn to effortlessly manipulate this system in a very short time. And then when you apply this to other types of scales it becomes even easier because you already have these skills. 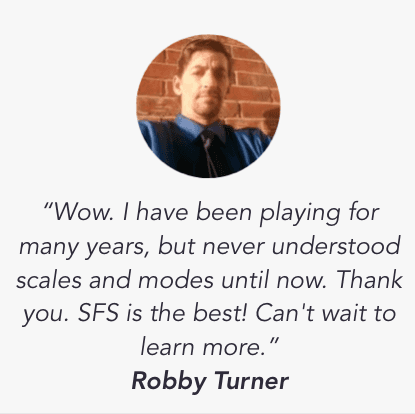 So in the long run you save a tremendous amount of time and effort by ditching memorization and learning to build scales using SFS. 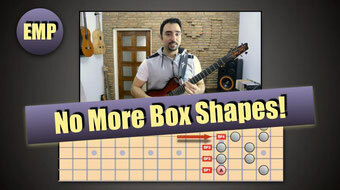 If you want to know more about this system, sign up for the free crash course below, where I teach you how to go deeper with this, and reach a point where you can move freely on the fretboard, without having to memorize shapes ever again. Enjoy your practice and be effective!